It was back in 2005 and I was on my way to Ridley Road market. At Dalston junction, Hackney, London, my eyes caught a flyer minding its own business. But being a nosy lady, I could not help but notice it had the image of an elderly man dressed in African attire. I picked it up and in the hands of this elderly man was a traditional African fan or something that looked like it and I was intrigued because for the first time since 1996, when I moved to the UK, I finally found a theatre which produced African plays. I was ecstatic and my life was about to change. Even I was unaware of the change that would take place. The theatre was Arcola Theatre on Arcola Street and it was not far away from the place where I found the flyer. I was so happy, I walked all the way to Arcola Street to find the theatre and made enquiries about the play and how long it was running. I learnt the coming Saturday would be the last. I was broke, flat broke and did not have a penny or a pound when I saw that flyer but I found money and even dragged a friend along. It was heavenly. The play, The Gods Are Not to Blame by Ola Rotimi. I had heard so much about Ola Rotimi as a child but was never privileged to see any of his plays. In an ironic twist of fate, the play’s director, Femi Elufowoju Jr, had been on the same bus with me a few days earlier. I remember, I kept turning back and looking at him as soon as I realised he was discussing theatre matters on the phone. It was the bus 38, which as at then was the old Routemaster. Let me stop here and say, I have never looked back since I saw The God’s Are Not To Blame. It reawakened my passion for theatre, the way I had known it at home before I came to the UK. It also assured me that I could write about Africans and someone would see the artistic value of my work like Femi Elufowoju Jr has done anytime he has read or helped to critique any of my plays and he encourages me to keep writing . Its 2010 and Tiata Fahodzi is back with Blue/Orange. Believe it or not, it is also at the Arcola Theatre. Tiata Fahodzi translates as ‘Theatre of The Emancipated,’ and is considered to be the leading British-African Theatre in the UK. The company has made celebrating and placing Africans at the heart of British theatre its primary goal for over a decade. As its founder and artistic director of over 10 years, Femi Elufowoju Jr, says goodbye to the company, here are snippets of various interviews with him over the last few years since I first stumbled upon Tiata fahodzi back in 2005. In his own words, Femi Elufowoju Jr, and the journey of Tiata Fahodzi. Belinda: Why did you decide to make it a British-African focused theatre as opposed to doing theatre for the sake of it? Femi: The reason why the company was formed, the company was formed in 1997, with one specific mission in mind; I had a small ambition, and it wasn’t huge. It was a small ambition to try and redress in my own small way the perspective of black theatre in Britain as it existed then, which was arguably of a huge Caribbean persuasion, dominated precisely by an art form which was critically and massively accepted and acknowledged from the British Caribbean point of view. 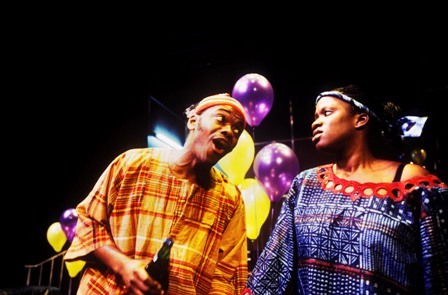 We are talking about the early 90’s here, when African theatre was practically none-existent in the mainstream. So, I had the opportunity as a theatre facilitator and storyteller to redress that balance in a particular way and that’s why I formed the company. Belinda: What has the experience and journey been like since you started the company? Femi: It has been a huge learning curve. Running a theatre company is like running a crèche, where mothers bring their children into the crèche and you have got to look after them and nurture them. You have a huge responsibility and remit to manage personalities, needs and concerns. Running a theatre company goes beyond actually producing a play. It is about fulfilling certain criteria’s with the funding body, keeping artist prepared and keeping them happy, valued, managing people and personnel and then producing the work, which is the most important thing. What members of the audience want to appreciate and connect with is the work. They don’t want to know that…so you have to apply for funding and deal with an actor’s ego or a pension plan that you haven’t put in place. They don’t want to know all of that. They just want to see the work. So it’s been an eclectic variety of exposing one’s self in all sorts of ways. The journey has had its fair measure of trail and tribulation and emotions and celebrations, triumphs and despair but I would love to think that the best part of our latter years as a company are of a huge celebratory feeling, a very euphoric time for us. Belinda: How difficult or challenging is it to tell the African story on the modern British theatre stage? Femi: One thing I am currently working on is clarity; that is a constant challenge for me. Which is to enable the story tellers and actors fulfil the very purpose of their remit. Which is to be able to tell stories clearly and even though we are governed by a particular language pattern, a particular vocabulary which is very safe and very convenient for us, the victory for us is to be able to transfer our nuances to a very oblivious audience and they will accept it, they will understand it and it will be all comprehensive. So, that is a challenge which I face each and every day. I work with actors but the job is to be able to convey the ethos and impact of a production and make it safe for them, confident that they will be able to deliver those stories and we are confident of that. Belinda: What are the artistic values you look for in a script before you decide to commission or run with it? Femi: I am very excited about writers, writers who are visionaries really, writers who think like journalist, who have unique experience to them but universal in terms of its resonances, a writer, who can write dramatic action. I don’t like polemic plays that just go on and on, talking, talking and no dramatic action. I like plays that I can take my children to really. I love writers who can write dramatic action and can tell a story effortlessly and keeps the audience at ease. Keeping the audience at ease is a skill, having an ear for dialogue, who have a good idea about dramatic structure, the plausibility of a scene leading into another. Stretching the imagination and making it chanting and magical and electric. I love writers who can stretch the audience’s imagination and challenge our perception. Belinda: Now taking this back to when this play starts, it is black history month, was it a conscious decision to do that? Femi: No, Femi Elufowoju Jr and Tiata Fahodzi don’t do black history month. What’s all that about? Celebrating our history is one month. It has all just happened by default. There are 365 days in a year and I think the black experience should be experienced everyday and not designated for a month. Belinda: You have over 15 productions for the company how does each one compare to the previous one ad you have journeyed along on this path? Femi: For every production, I always try to up the bar. I always start by going, this play will be the best play I have ever done. But somehow, I still feel the Gods Are Not To Blame, 2005 will remain my most special production. It was a special one. Femi: Because it’s the first play that I have ever done and connected with every single muscle in my body. Because it was the first play I ever saw ever as an 11-year-old. It was the first piece of theatre I ever went to, live direct action and all. It was at the University of Ife, run by the Ola Rotimi theatre Company when he was still alive. So in that respect, it was, and it was the first indigenous piece of African theatre that I had ever seen. And in that respect, I wanted to replicate that experience with my production and I would love to think that I have succeeded by 99.0 per cent. So yeah, that was the play, in terms of bringing absolutely that African theatre production and finding that compatibility with the British stage, that’s what happened with that and I think I will ever be able to replicate that again with another play. Not unless I do Nigeria the musical or something like that. Belinda: If you had the opportunity, would you do The Gods Are Not To Blame? Femi: I am reviving that play, even if it’s the last thing I do in my dying days. We have come a long way from our mission statement, our artistic mission statement; we wanted to say something about redressing. Now we feel that we are at a place where we can leave the really classical indigenous forms of African theatre and now try to embrace theatre forms from both South of the Atlantic, British and Africa. Belinda: Do you think black British theatre still has a lot to do in order to compete on the same stage as other major theatre companies? Femi: No, we have done it all now. they have got to now work to connect with what we are doing because we are doing it. The mainstream now needs to wake up and pick up their eyes and come to us. We are at world class stage and we are doing our stuff? We could be at the National Theatre everyday. Belinda: Theatre to me is supposed to be inclusive and not exclusive to a few in terms of those who work in it and come to see the shows. What do you think more people from the BME need to do in order to break into mainstream theatre? I mean they are doing it but we need more people out there. Belinda: So the landscape needs to change? Belinda: Why are you leaving the company that you founded? Femi: There is something quite perverse about power and the amount of time I have spent running the company. I have been running the company for a long time, 13 years and that is a long time to run a small company that is not building based. One is almost shackled, not shackled in the negative sense but one is manacled to a mission statement, a mission statement that I set up in the very beginning and it’s a delightful mission statement and I think serving it for longer than 13 years could be construed as rather monotonous because it is the one set of values over and over again. And even though there has been room for development over the last six years, I mean the company has grown exceedingly since 2002 and now and the kind of headway the company has made, the kind of presence, the visibility and the profile which is engendered has been astronomical in terms of its achievements and I am very proud of that. However, there could be a danger whereby the company will get to a standpoint or a position whereby it will get to the preface of conceding of a production or an idea and it will be pretty obvious to many that we are trying to redo it and that it has been done before. Are there any rooms for innovation? Well, I personally think if there is going to be room for movements, enhancements and improvements, the next level will be someone coming in with a new sense of vigour and energy and complete and utter zest, a new zest for the company’s life source. And in a way, that person isn’t me because mentally, the repertoire has been exhausted. I have exhausted the repertoire. Belinda: Having said that, will you still have any input in the day to day running of company in terms of the plays and the work it is currently doing? Femi: Can I just say that I have not exhausted the theatre company. At the end of the day, I want to run a building and that is an even bigger vision and bigger challenge for Femi Elufowoju jr. However, I know that I’ll be able to diversify much wider and broadly with that new challenge because a building will give me…even though that will have a mission statement, it will have a constitution and the parameters of its repertoire, I think as an artist, I will be able to sort of meander a bit more and take bigger risk. Belinda: In that case, are we to expect a building dedicated to African theatre? Femi: No, no, that’s not my charge. That will never be my charge. There are buildings dedicated to African theatre in the Diaspora already and we know them and they are not as visible as we would like them to be but they are doing their own job. In fact I want to move away from African theatre and I want to come back to African theatre when I am absolutely starved and I am really craving for it. I want to go out and do Ibsen, I want to do Stoppard, and I want to do a musical. I have been doing this for 13 years and I want to do other things. It has inspired my creative juices doing this. Belinda: Are you nervous about doing this new step that you are taking which is totally different to what you have done to date? Femi: I am only anxious about the unknown. We were talking about power, I will be de-investing myself from having that natural ability to control an infrastructure within theatre and theatre-making, you know, putting an ensemble together. I have been an impresario and that’s what I have been, I have been an impresario for 13 years. Now I am going to be called upon to just be one of…to fulfil one strand of what I have been doing as a whole, which is directing. I will now just be expected to turn up at a gig. So, I am anxious about the tenacity that I am not going to have. Belinda: So in that case, you are practically becoming a freelance agent? Femi: Yes but that tenacity that one has and always has for ensuring that the work is artistically secured and profound and supported and that it’s good. I am not going to have that natural ability, that natural support and natural conduit to ensuring that anymore because I’m no more leading, so to speak. There is an anxiety there. Belinda: What should we expect from Tiata Fahodzi in the next decade/future? Femi: In the decade, I don’t know if I will be around for that long. But we have surprises in store actually. Belinda: In terms of legacy, what is that one thing you want people to remember you for in terms of theatre? This entry was posted on Monday, October 25th, 2010 at 4:56 am	and is filed under Africa, Black Britain, Interviews, Journalism, Nigeria, People, Theatre Interviews. You can follow any responses to this entry through the RSS 2.0 feed. You can leave a response, or trackback from your own site. Can my written script be developed by you? I have not the finance to publish them. Can you help me?